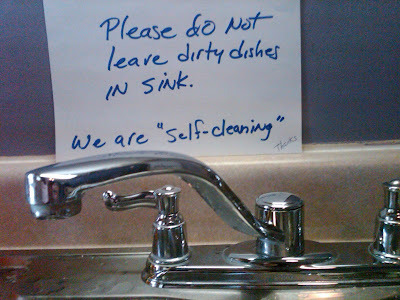 The “Blog” of “Unnecessary” Quotation Marks: who cleans it? I'm guessing this isn't the dishes talking. But maybe it IS. Thanks, Tim. I like the tiny Thanks in the lower right corner as an afterthought. That's what should be in quotes. Maybe that sign was written by cats. I think the sign was meant to read: "We are 'self-cleaning'.... NOT!"